Ducati’s Andrea Dovizioso recorded his second MotoGP win in a seven day span earlier today at the Catalunya circuit near Barcelona. 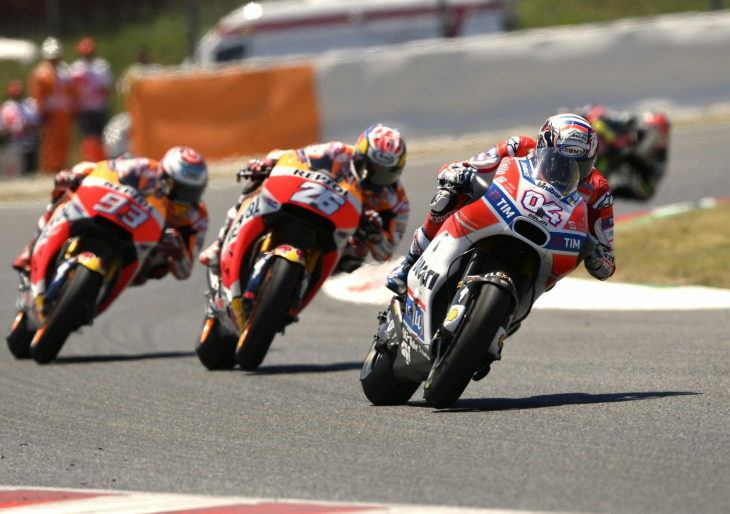 Factory Honda riders Marc Marquez and Dani Pedrosa finished in second and third place, respectively. The weather was very hot during the race, and several riders experienced severe traction issues throughout the weekend, most notably the Factory Yamaha duo of Valentino Rossi and Maverick Viñales. Uncharacteristically, Rossi finished in eighth position, and Viñales in tenth. Although Viñales continues to hold the points lead in the championship, Dovizioso has closed the gap to second place down to just seven points. Follow this link to full race results. For additional details and points, visit the official MotoGP site. Not many talking about Lorenzo, who “Dropped like a stone”, only to find some traction late in the race and work his way back up to fourth. Interesting, he has been fast early on in the last two races, if Ducati can continue to work with him to resolve his issues, possibly his decision to leave Yamaha and ride for Ducati, wont be looked at so crazy anymore. Dovi is incredible. Seemed strange the Tech 3 guys seemed to have less problem with grip than the factory Yamaha riders. Rossi now feels the newer Yamaha racers like he has don’t handle as good as last years racers like the Tech 3 riders have and he’s unhappy. Both Zarco & Folger are doing just fine on last years Yamahas. With the results of the last few races, can we declare the Age of the Aliens over? Norm? Where are you? Come on…. oh yes i was in fact planning to go there, but i decided to let the thread build up some more comments. Q: can we declare the Age of the Aliens over? ladies and gents by the power vested in Wendy by the Illinois Bar Association she now ushers in the AGE OF NATCORK…!!! I suppose Dovi did overcome RK. That of the opposition being EVEN MORE R than his own…. see everybody, Tim gets it. btw DE why no coverage of the TT fortnight this year…? what gives or did i miss it…? talk to me Goose. after all of Gigi’s concern, it sure looks like the banning of aero was the best thing to ever happen to the Desmosedici. without the “crutch” you’re now FORCED to set the bike up around what you’ve got. crazy concept innit…? May I suggest this to the powers at be in MotoGP. Lets split the race in two. Same total distance as now but do it in two “motos”. Qualifying remains the same. That way we might see a bit more racing instead of tire conservation. Good ride again by Dovizioso. No thank you. Lap 1/Turn 1 crashes increase exponentially, injecting random unnecessary risk into the outcome with no upside. Time down between races = boredom. On a different note: it’s obvious that non-motorcycle football and other celebrities on the starting grid increase Dorna’s stock and overall series financial health. Still though, I dislike the circus atmosphere, and would banish all non-MotoGP marketing trash with a clear starting grid pass requirement: need to go or pass forbidden, period. Gotta love an unpredictable race – just like a tossed salad!! The rankings are coming out like I expected, the newer guys are getting closer to (or staying at) the top while Rossi slides slowly downwards. Strange that the new guy on the other factory Yamaha faired even worse than Rossi. The factory Yamaha crew simply failed to find a setup that worked. Happens every year to every team. Very happy for Dovi, a fine rider and gentleman who was dropped by Honda. Dropped by Honda..Really? What was Repsol Honda going to do at the time? Can Pedrosa or Stoner? Dovizioso has won two races in his entire Motogp career prior to this year. Hey I like Dovizioso. But please spare us the Honda haters rhetoric. Technically not dropped by Honda, who offered him a ride on a satellite bike (they had fielded 3 factory bikes, dropping to just Stoner & Pedrosa). He refused Honda’s satellite ride opting to ride a Yamaha satellite bike instead, presumably for more $$. I don’t hate Honda, I ride one and have owned many. I think Honda made a mistake and should have dropped Dani, and no, I don’t hate Dani either. He’s a great guy and a gentleman but I think Dovi could have done better for Honda. Dovisioso came out ahead of Pedrosa in the championship that year, but then Pedrosa missed a couple of races, too. Race by race, Pedrosa and Stoner both routinely out-raced Dovisioso. That’s crazy talk. You cannot look at Dani and Dovi’s records across their time at Honda together (or since) and imagine that Dovi was the better choice. He’s a great rider, but Dani has delivered wins in 16 of the last 17 years (only his rookie season on a 125 did he fail to earn a victory). Over 17 years his average championship finishing place is 3rd. Have there been better riders than Dani? Yes, but only 3 of them. Dovi would have done better in some races and worse in others. Dani’s light weight really helps him in many conditions and tracks. He’s a fighter and unlike Nicky back in the day, can go from way down to the front again and again. He will qualify poorly and then overcome that in the race. Other riders languish right near where they qualified or even fall back a couple of places. Dani and Dovi have both made for exciting racing. Dovi outscored Dani in 2011 but Dovi was most likely let go because Repsol wanted at least one Spanish rider on the team. Dovi’s fortunes went down from there, first riding for the satellite Yamaha team and then on the Ducati team at the height of their problems. I am just stating an opinion and do not believe that it is a “crazy” one. Repsol’s decision may have been the best but we’ll never know. Birds, in 2011 Simoncelli wrecked Pedrosa and he was out with a broken collarbone for 2 months. He still won 3 Moto GPs that season, 2 after the broken collarbone. Still 8th and 10th pay better points than crashing out or breaking a bone and Assen is a Yamaha track with fresher asphalt than what they had to put up with this round. We’ll get to see if the old goat is really washed up. Okay, when you’re thirty-eight and still racing in MotoGP like Rossi is then I suppose everyone else is a “newer guy,” but in general terms I would hardly call Dovi, Jorge, or Dani “newer guys.” Mark really doesn’t qualify as a “new guy” anymore, either. The only “new guys” that did (relatively) well today were the two Tech 3 Yamaha riders, and they both experienced similar if lesser difficulties than Rossi and Maverick with a lack of grip. Agreed, I wonder why the Tech 3 bikes seemed to perform better vis a vis the tires. Less power, different setup I suppose? 2017 Tech3= Last year’s factory bikes. Honda has reverted to previous year’s chassis a time or two in the past. I don’t know if Rossi has that option, it if he even wanted it prior to this past weekend. Quite a poor state of affairs when a hot, sunny day feels like a mixed-conditions rainy track to the entire grid. Very telling, Dovi’s post-race comment that he could never accelerate hard, nor brake hard, despite winning the race with relative ease. Marquez echoed those comments; this, coming off a four-crash day yesterday, plus another crash in morning warm-ups. Pole-sitter Dani also couldn’t push hard, and these are normally perfect conditions for him. Like Lorenzo, when Dani is on pole he can usually be counted to check out early and run away. Never mind all the others who couldn’t find any traction at all, but when even the top three finishers had to tiptoe around a dry track, yes, it’s “strange,” as Dovi so charitably described it. Also strange is the fact that Yamaha won at Jerez and Catalunya in 2016, yet not a single Yamaha made it straight into Q2, which had never happened before. Then, come race day, #46 starts from thirteenth on the grid before finishing a distant, lonely eighth, and still he finished ahead of his championship-leading teammate, who was also beaten by seventeen-time crasher Hector Barbara on a two-year-old Ducati? Something is clearly wrong here. Gigi and the rest of the brass at Ducati must cringe every time someone sticks a microphone in Dovi’s face. Even when he pulls off an historic pair of consecutive wins, he continues to tell the world that it was mostly just a result of specific track conditions and unique circumstances, neither of which can be counted on to carry them at most other tracks. Same problems as 3 years ago? Perhaps, but they’re clearly smaller problems than before and the others are now less consistent than the Ducati. Sounds like the tire supplier is on the hot seat. By the end of the year these teams will have spent a lot of extra euro’s fixing their bikes..
It’s amazing to watch them going so fast, leaning nearly 55 degrees at 125 Kmph, and then hear them complain about lack of traction and how they weren’t able to push. Supermen I tell ya. Just phenominal. Good race by Dovi he looked very controlled, almost”Lorenzo-like” in his smoothness and speed. Cut mickey some slack. He proudly rides a CB1100, very slowly. In dog years, his 75 mph is like 160 mph! I think he meant “125 mph”, but lean your streetbike over 55* at 75mph. G’head, I dare ya’.. I was just going to say the same. Doing so on the street would feel like 125 mph. if you watch the race, the slow motion replay that has statistics on the bike, clearly shows 125KPH, 55° lean angle. I’ve ridden with Mickey on the Dragon and a lot of young fellows on their crotch rockets might find it challenging to hang with him for a full day in the twisties. Mickey is smooth, fast and tireless. The Dragon is so tight/slow, I can’t imagine anyone bragging about their speed on that. Ride the roads in norCal and then brag about it. Anyone bragging about how fast they go on a public road will ‘Eat their Words’ one day. NOT a smart thing to talk about or do. Randy,Roxx, I would never brag about how fast I am and only consider myself an above average rider. I have seen great riders, I am not one of them. I am as birds said smooth and tireless though. To me the key is smoothness and being able to read the road/curves so you can choose the proper line thru the curves. All roads are basically the same, being made of of combinations of left and right curves or turns of varying degrees/radius and straights. Every road is either straight or has curves in it. Guys in Cali like to brag about their roads but from my experience talking to many, many of them online, they ride the same roads all the time, but have never ridden anyone else’s roads, so have nothing for comparison. There are equally good roads in North Carolina, Tennessee, Kentucky, West Virginia, Arkansas and in sw Ohio in my experience and yes I have ridden great roads in all those states AND on some of the best Cali roads. All the same, just in different locations.